Minnesota history is written in the landscape. Rolling hills, grasslands, woods, and water are as much a part of the history as the people who have called it home. Ancient burial mounds are part of the Minnesota landscape too, and they are also part of a larger story of the Dakota people in Minnesota. Like the mounds, much has happened to the story of the Dakota people. Europeans settled and without understanding the importance of the culture they were impacting, treaties were written, lines were drawn, people were exiled, mounds were leveled, and over time other sacred landmarks have been hotly contested for development. 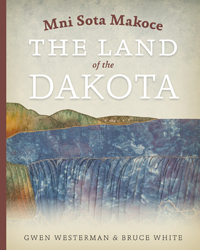 Until the recent publication of the award-winning history book Mni Sota Makoce: Land of the Dakota, a Dakota version of their history in Minnesota has been too often misrepresented. The Dakota have a strong oral tradition, and because the history hadn’t been written down, their story became largely a reflection of misinterpretations, poor translations, omissions, and oftentimes singular points of view. The Dakota story suffered. In order to provide the Dakota version of their history in Minnesota, Gwen and Bruce worked with a team of collaborators to sift through the layers of history and hurt to bring forth an uncovered story—this time from a Dakota point of view. Seeking that richer truth, Gwen and Bruce sought the Dakota version that is missing from many generally-accepted historical accounts of the Minnesota story. Gwen led the group that collected the oral tradition stories of the Dakota people, and Bruce directed the research of primary sources, including written documents, treaties, journals, maps, and art. The finished product was the book, published in 2012 by the Minnesota Historical Society Press. 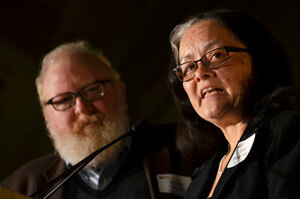 Their work is changing the conversation about the Dakota people in Minnesota. 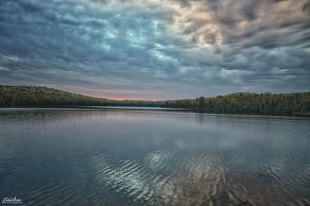 The name Minnesota comes from Dakota people who named their homeland Mni Sota Makoce. In translation, the name means “Land Where the Waters Reflect the Clouds.” It is a beautiful and accurate description of the land in Minnesota, but for the Dakota people it is more than just a place or a name. The Dakota people have a deep relationship with land, and understanding that relationship is an important part of the motivation to publish this book. Over the course of history, the story has been told, written, manipulated, and accepted to reflect the European version and perception of Minnesota history. Writing down the Dakota perspective adds validity to their history. Gwen Westerman and Bruce White talk about the importance of their work collecting Dakota history from a Dakota point of view. Bruce hesitates to consider the findings in the European writings as confirmation of Dakota truths. He explains that what is written are also reflections, but they do add layers to the full story. One of the most important parts of this project was to put into writing the Dakota perspective. For two years, Gwen and her team of researchers collected the stories. Their initial contacts connected them with tribal historians who seemed to be repeating what they had learned in European-version history books. Gaining access to the story holders meant connecting with the people most tied to the traditional Dakota lifestyle and it required a more traditional approach. Equally effective to tracking down the longest-standing oral traditions was gaining the trust of the storytellers. Establishing relationship is the Dakota way, and collecting and publishing Dakota stories is a validation of a culture that has been omitted from the accepted history of Minnesota. One of the first years Gwen lived in Mankato, in the early 1990s, a colleague at the University invited her to go see the Native Americans who were coming to town on December 26. She and her friend watched the midnight runners run into Mankato in honor of the 38 Dakota killed by hanging in 1862. In the parking lot before she left the event, she says, “I had an experience that I didn’t know how to explain. My stomach came up and I started weeping and I didn’t know why. I called my uncle and told him and he said to me that I was connected to this place in ways that I did not yet understand.” He told Gwen she was going to be a bridge for the Dakota people. “This book is part of that,” she says. Town after town, lake after lake in Minnesota, the names given have their origin with the Dakota people. Landmarks, towns, lakes and rivers are not just a part of the landscape to the Dakota, however. Those physical places are members of their family. Gwen hopes the book will change the way Minnesotans view the land they call home. “How differently we would treat this place if we treated it as our relative instead of as a commodity: something we’ve bought and sold, or thrown away, used, and transferred,” Gwen says. Traveling the landscape from Nebraska to Manitoba to collect the Dakota stories gave Gwen a greater appreciation for her past, her place as the bridge between that past, and where the story will go from here. 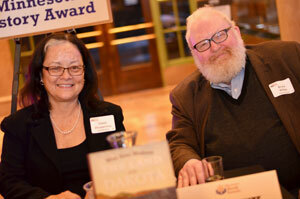 Gwen Westerman and Bruce White won the Minnesota Book Award for Mni Sota Makoce: Land of the Dakota. Grateful for the platform to document a credible Dakota history, Gwen and Bruce both believe this book will be the start to many more writings about the Dakota culture. Gwen is currently working on a historical fiction book, and Bruce thinks it is a necessary step to presenting a richer truth of the Dakota past. This history book is opening the path for people to tell a better and richer story about the Dakota people and their homeland by adding the Dakota voice to the written word. Inset photos courtesy of The Friends of the St Paul Public Library.